It feels like *insert your over priced coffee place of choice here* without the *overpriced coffee barista invention* and the *inflated fat and calories* which leads to an *inflated you*. hehe got a little carried away with the stars there. The nice thing about this frother is that it seems to get it’s frothiest with skim milk and soy milk. My husband has tried it with cream and with those special flavoured coffee whiteners. Just not the same. It forces you to have a healthier coffee just to get that nice foamy latte. No need for whip cream to feel indulgent. For me I find it actually helps to kick any whip cream craving. We’ve gone beyond coffee with this thing too. Hot chocolate and even chai tea has gotten a nice fancy topper. 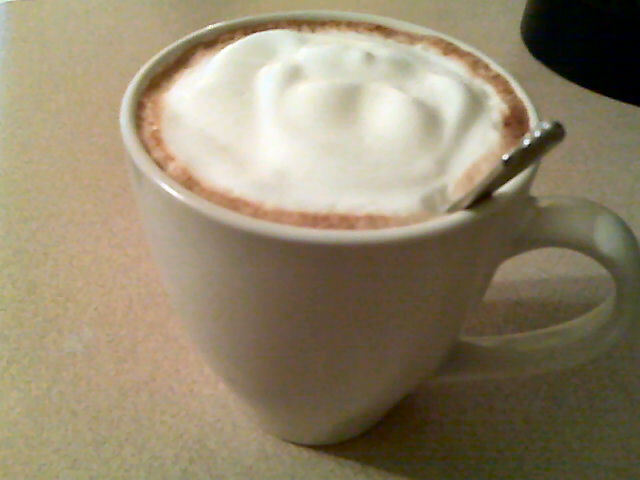 Now if only I could do some of that coffee foam art. All you do is fill your cup about a quarter of the way with milk. Some folks like to heat it for about 20 seconds in the micro…I’m in too much of a hurry for some coffee, I skip it just fine. Foam it up to desired lift. Pour in your coffee, hot chocolate, tea, whatever. Flavour and tada! Fancy hot drink to help you start your day. If you go with tea or coffee all you have to worry about is the calories and fat in your bit of skim milk you used. Which really won’t ruin your day so go ahead and pair that bad boy with a nice low fat and low calorie scone, muffin, or bagel for that coffee shop feel. Note: we have one of those keurig single serve coffee things. Which I must say has totally been worth it, especially with my husband being on various shifts at the base. He’s not always there in the morning to share a cup. Just one cup, not a lot of waste, and you can get all sorts of fair trade varieties!